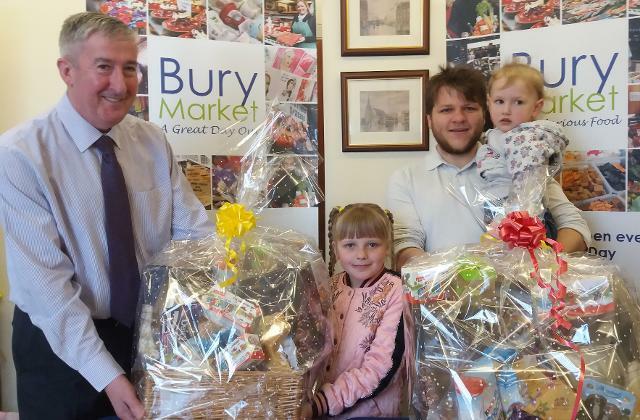 Two lucky visitors to Bury Market took away a packed hamper of chocolate goodies after winning the market's Easter egg hunt. Shoppers were invited to walk around the market looking for ten pictures of Easter eggs, and everyone who filled in a form was rewarded with a chocolate egg and entered into the prize draw. Keeley Johnson from Chadderton and Tom Spoore from Bury came up trumps, and were presented with their hampers by markets manager Andrew Heyes. Pictured: Markets manager Andrew Heyes with Easter prize winners Keeley Johnson and Tom Spoore.